Russia’s diplomatic involvement in Afghanistan returned to the spotlight on November 9, as Moscow hosted direct talks between the Taliban and representatives of the Afghan High Peace Council. These historic negotiations were convened by Russian Foreign Minister Sergey Lavrov, and notably included India as a “non-official” participant, in spite of New Delhi’s circumspect attitude towards diplomacy with the Taliban. While Russia’s decision to invite the Taliban to a multilateral forum raised eyebrows, as Moscow has officially designated the Taliban as a terrorist group, it reflects contemporary geopolitical realities in Afghanistan. A recent SIGAR report to the U.S. Congress revealed that only 56% of Afghanistan is administered from Kabul and the Taliban wields greater influence now than at any point since its overthrow in 2001. The Taliban also achieved a major tactical victory by assassinating Kandahar’s police chief, General Abdul Raziq on October 18, and is well-placed to launch a renewed territorial offensive in southern Afghanistan. The Taliban’s resilience in the face of intense aerial and ground assaults from NATO forces has convinced Russian policymakers that the Taliban cannot be vanquished through the use of force. 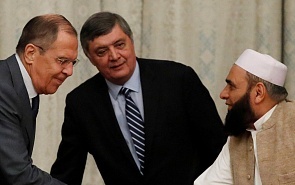 In addition, as the Russian President’s special envoy to Afghanistan, Zamir Kabulov, recently noted, engagement with the Taliban is necessary for a nationwide political settlement, as Taliban-controlled political and legal institutions are viewed as legitimate in much of the country. Although an objective analysis of the current balance of forces in Afghanistan underscores the pragmatism of Russia’s decision to engage with the Taliban, the United States declined to participate in the Moscow-format talks. The U.S. Department of State justified its abstention from these negotiations by stating that the U.S. would only engage with the Taliban if representatives of Afghan President Ashraf Ghani’s government were also present. This argument was consistent with the U.S. government’s past official statements on Afghanistan, but is out of sync with Washington’s recent efforts to engage the Taliban at a bilateral level. In June, Taliban officials met with the U.S. Department of State’s Alice Wells in Qatar, and in mid-October, U.S. envoy to Afghanistan Zalmay Khalilzad travelled to Doha to discuss conflict resolution with the Taliban. This pattern of engaging the Taliban in informal negotiations without Ghani’s consent suggests that U.S. criticisms of the Moscow-format talks are motivated primarily by mistrust of Russia rather than a substantive disagreement in policy. Concerns about Russia’s intentions have caused U.S. officials to view the parallel Tashkent process as the optimal format for peace in Afghanistan. Therefore, the United States will likely encourage Uzbekistan to step up its mediation efforts between the Taliban and Afghan officials, as a breakthrough in Tashkent will restrict Russian diplomatic influence in Afghanistan. Although the U.S. and Russia continue to disagree over the merits of the Moscow-format talks, both countries can attest to the challenges associated with promoting intra-Afghan dialogue. After the talks, Sher Mohammed Abbas Stanikzai, a Taliban spokesman, told journalists that the Taliban refuses to engage in dialogue with the Afghan government, as Ghani assumed power through illegal means. Officials in Kabul are similarly disinclined to engage with the Taliban, after the Taliban interpreted Ghani’s ceasefire offers in June as a display of weakness. Given this atmosphere of distrust, direct Kabul-Taliban negotiations are unlikely to occur unless one of two scenarios come to fruition. The first scenario is that the Taliban expands its territorial control in western and southern Afghanistan to the maximum attainable levels, and pushes for a peace agreement from a position of strength. This outcome would likely result in a frozen conflict, and the de facto bifurcation of Afghanistan into two hostile sub-states. The second scenario is that brewing factionalism within the Taliban causes a major schism in the organization, and forces it to sue for peace with Kabul. This outcome would marginalize the Taliban, but leave Afghanistan vulnerable to a strengthened ISIS-K insurgency and to periodic violence from warring Taliban factions. Although neither of the two most plausible scenarios for Kabul-Taliban dialogue are likely to unfold for the foreseeable future, the Moscow-format talks are significant as they underscore the unified commitment of non-Western countries to ending the war in Afghanistan and demonstrate the Taliban’s willingness to participate in multilateral diplomacy. Despite these achievements, conditions on the ground in Afghanistan, rather than the interventions of external powers, will determine whether Afghanistan’s decades-long state of civil war will come to an end.